"The challenge is to bear in mind the financial constraints of the exhibitors"
Last year, we put a lot of thought into how we could help younger galleries and address the unfairness of the price policy [for stands] at fairs. We believe a lot more needs to be done. Last year, the basic price was €579 per square metre. We reduced that tariff this year to €550 per square metre for the smaller stands which will help the young galleries [the fee for the largest stands have increased by 2.2% to €650 per square metre]. We’ve always believed in helping emerging dealers; indeed, our subsidised Lafayette sector has had a real impact. The Los Angeles gallery Friedman Fitzpatrick had a stand in that area and has since opened a space in Paris. "The challenge is balancing art fair schedules with exhibition programmes"
I think that the main challenge now for galleries is the articulation between art fairs and gallery programmes and exhibitions. Over the years, we have grown increasingly dependent on our fair participation. At first, they were just an additional channel to promote our artists, especially abroad, but now they have become a structural part of our global strategy, sales, artists’ promotional efforts, representing 50% of our sales and clients. Each art fair represents between $100,000 and $200,000 of expenses (booth rental and build up, shipping, travels). It’s an important investment for a five-day event, and galleries of our size. They are time-consuming, they require fresh inventory—high end inventory too to make sure we break even—and this ten or 12 times a year. Selection committees can also be very demanding and influence what we may show or may not show. We are thus always working on two different levels: a local one with strong shows, expertise, catalogues and a more “nomadic” one from fair to fair, more explicitly geared towards sales and short-term buzz. It’s sometimes conceptually hard to reconcile. Financially, they represent a huge constraint and a high risk. Yet global art fairs like Frieze or Art Basel are [the] only means to counter the influence of our main competitors: auction houses. "The challenge is keeping up with the demands of the fair system"
For me, the biggest challenge is operating in the current fair system. The top of the market pyramid is the art fair and it shouldn't be like that. The bottom is the education system and institutions such as art colleges; it should be the opposite. Having a fair in every city is not sustainable; there are not enough collectors! Younger generations and galleries are not interested in working hard to get into the major fairs. I believe in working in a more traditional way by working closely with artists on exhibitions, for instance. Fairs can be an important place for us to meet others though. "The challenge is sourcing quality material"
The problem is somewhat different for the primary and secondary dealers. For the former, the race to gigantism—the cost involved, the fight for the hot artists and the difficulty to keep them on board, and constructing a brand—are key. For secondary dealers, renewing top-quality inventory at decent prices has become almost impossible, or at least extremely challenging. Both are facing the tremendously challenging fair model. Whether you are in (as Insiders) or out (or Outsiders) makes your life completely different. And less than ten fairs in the world really matter. Both [types of dealers] have to take into account the auction system, whether it is for competition (secondary market) or confirmation (primary market). "The challenge is finding new works outside the usual 'overly commercial' venues"
What struck me at both Frieze and Fiac is that most galleries bring material for selling which is not the same as bringing challenging material to make an impression. The dealers bring big, recognised names because they want to make sure they can sell and cover their heavy costs. The comparison I use are the day sales; I was surprised by the strong prices for the quality material in the sales at Christie’s and Sotheby’s during Frieze. The fairs are all about branding; you can compare the big dealers to flagship stores presenting the fanciest shop windows or vitrines. But I believe there is still a future where people will pullback from the shopping mall model and want the equivalent of independent stores that offer late openings and collaborations with their peers. 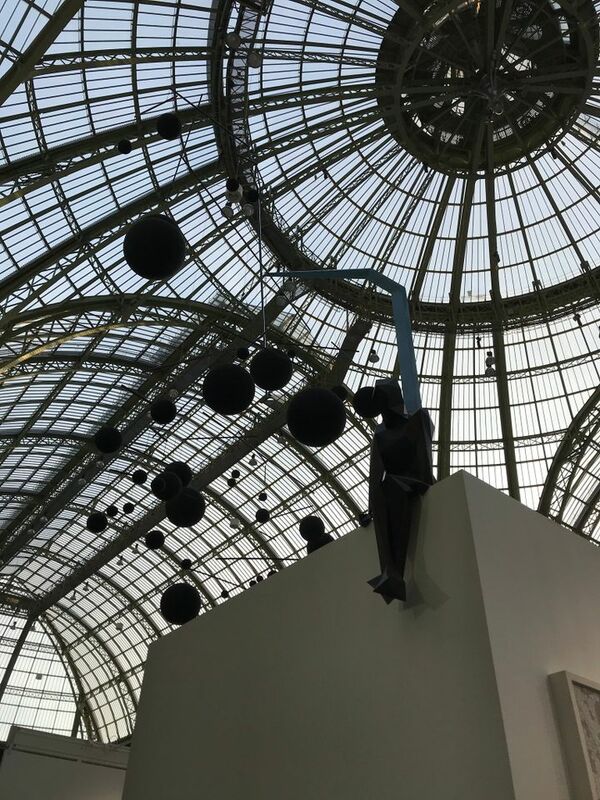 But you have to watch prices; I think, for instance, that prices at the Paris Internationale fair are on average 40% too high in many cases to induce the risk of acquiring more challenging works by younger artists. For snapshots and sales from the fair, see our Instagram page.